After his father died, when Elijah was just two years old, Elijah's brother and sister went to live with the family of uncle Thomas.18 It is not known what became of Elijah, although it is possible that he went to live with his uncle Elijah. See: Elijah Hinshaw. Henshaw, Elijah, age 29, born in Indiana; farmer; $150 personal property. Henshaw, Ruth, age 22, born in Indiana; keeps house. Henshaw, Loretta J., age 5, born in Indiana. Henshaw, Charles E., age 2, born in Indiana. Hinshaw, Elijah, age 39, born in Indiana; father born in North Carolina; mother born in Ohio; farmer. Hinshaw, Ruth, wife, age 33, born in Indiana; keeping house. Hinshaw, Loretta, daughter, age 15, born in Indiana; parents born in Indiana. Hinshaw, Charles, son, age 12, born in Indiana; parents born in Indiana; farm laborer; attended school. Hinshaw, Jennie, daughter, age 9, born in Indiana; parents born in Indiana; attended school. Hinshaw, Elmer, son, age 5, born in Indiana; parents born in Indiana; attended school. Hinshaw, Elvie, daughter, age 2, born in Indiana; parents born in Indiana. Hinshaw, Elijah, head-of-household, age 59, born April 1841 in Indiana; father born in North Carolina; mother born in Ohio; married 36 years; occupation: merchant, general; owned farm (free). 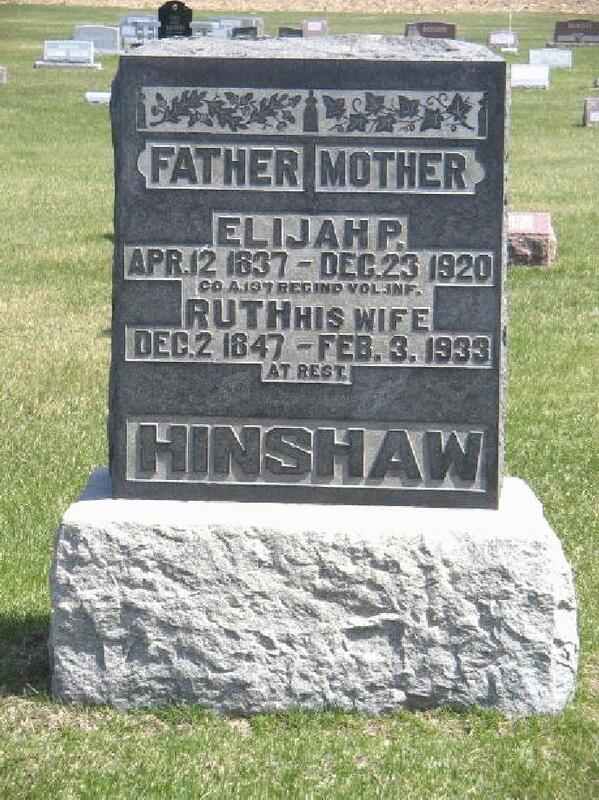 Hinshaw, Ruth, wife, age 52, born Dec 1847 in Indiana; parents born in Ohio; married 36 years; 10 children, 9 living. Hinshaw, Anna, daughter, age 16, born July 1883 in Indiana; parents born in Indiana. 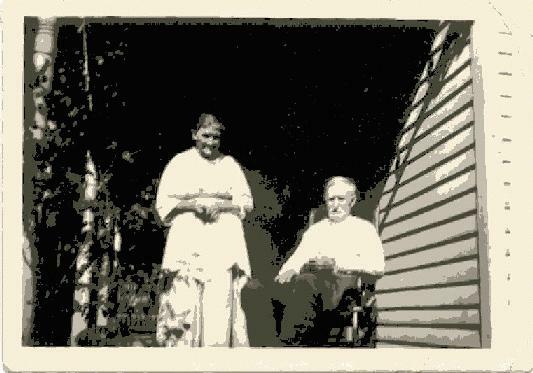 Hinshaw, Perry, son, age 14, born Feb 1886 [unclear] in Indiana; parents born in Indiana; attended school 6 months. Hinshaw, Blanche, daughter, age 11, born Aug 1888 in Indiana; parents born in Indiana; attended school 6 months. Hanawalt, Lloyd, servant, age 20, born Feb 1880 in Indiana; parents born in Indiana; single; occupation: hunter, general mdse. Hinshaw, Elijah P., head-of-household, age 69, born in Indiana; father born in North Carolina; mother born in Ohio; first marriage, married 35 years; occupation: retail merchant, groceries & drugs; owned home (mortgaged). Hinshaw, Ruth, wife, age 62, born in Indiana; parents born in Ohio; first marriage, married 35 years; 10 children, 9 living. Hinshaw, Perry M., son, age 23, born in Indiana; parents born in Indiana; occupation: salesman, groceries. Hinshaw, Verlie, son, age 18, born in Indiana; parents born in Indiana; occupation: farm laborer, working out. Hinshaw, Elijah, head-of-household, age 79, born in Iowa; parents born in Iowa; owned home; occupation: none. Hinshaw, Ruth, wife, age 70, born in Indiana; parents born in Indiana. Mrs. Ruth Hinshaw, who spent the past winter with her son-in-law and daughter, Mr. and Mrs. George Clouse of Kentland, is here for a visit with her son, Elmer Hinshaw, and daughters, Mrs. Frank Marker and Mrs. Junie Davis, and families. Hinshaw, Ruth, mother-in-law, age 83, born in Indiana; parents born in Indiana; widow. Hinshaw, Ruth, mother, age 82, born in Indiana; parents born in Indiana; widow. Contribution from Robert Davis () citing: family photo. 1930 census, Van Buren Township, Pulaski County, Indiana; roll T626-623, ED 14, page 7A, line #27, dwelling #145, family #146. 1900 census, Cass Township, White County, Indiana; roll T623-413, ED 128, page 1B, line #80, dwelling #20, family #21. 1910 census, Cass Township, White County, Indiana; roll T624-389, ED 208, page 26A, line #40, dwelling #194, family #194. Indiana Works Progress Administration; book H-3, page 232. 1920 census, Van Buren Township, Pulaski County, Indiana; roll T625-461, ED 177, page 9B, line #94, dwelling #211, family #212. Obituary of Elijah P. Hinshaw, "The Winemac Republican", Winemac, Indiana. 1850 census, Washington Township, Randolph County, Indiana; roll 168, pg 46, household #78. "Pulaski County Indiana Cemetery Inscriptions", book 5. Indiana WPA, 1939; book C-2, page 236. Marriage Index: Indiana, 1851-1900; Howard County, Indiana courthouse records, Kokomo, Indiana. Posting Aug 21 2001 by Ed Crabtree to INCASS-L.
Obituary of Ruth Hinshaw, "The Pulaski County Democrat", Winemac, Indiana, Feb 9 1933. 1850 census, Jefferson Township, Cass County, Indiana; roll 137, page 410, dwelling #108. Cemetery Transcriptions, Pulaski County, Indiana. Contribution from Ed Crabtree citing: death certificate. "Logansport Pharos Tribune", Apr 20 1925; http://www.ancestry.com. 1930 census, Van Buren Township, Pulaski County, Indiana; roll T626-623, ED 14, page 7A, line #1, dwelling #138, family #139. 1930 census, Union Township, White County, Indiana; roll T626-639, ED 18, page 1B, line #84, dwelling #19, family #19. Photo courtesy of Bob Davis ().